Pathfinder Payment Solutions is dedicated to one compelling mission: to deliver affordable and complete payment processing solutions to our customers, one customer at a time. We shun “cookie-cutter” answers in favor of customized, targeted solutions composed of services and products that fit each customer’s unique processing profile. We provide as much flexibility and choice as humanly possible. Our technologically advanced payment gateway accepts payments initiated through traditional, wireless and mobile terminals, the Internet (both merchant and customer initiated), and the telephone. And it supports credit and debit cards, ACH and eChecks, and electronic fund transfers. Now – and in the future – our company is committed to anticipating the needs of thousands of businesses that span all sizes, geographic locations, and industry types. We specialize in supporting merchants with unique needs or risk profiles. 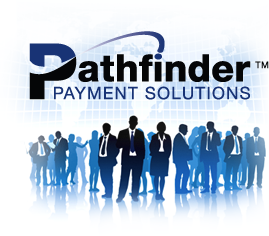 Headquartered outside of Washington D.C. with a national team of affiliates, Pathfinder Payments Solutions has been a leading payment industry provider since 1998.